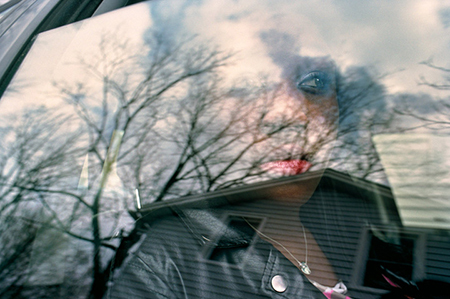 Photographer couple Alex and Rebecca Norris Webb collaborated to create this body of images featuring scenes of and people in Rochester, New York. This work is inspired by the bankruptcy closure of Eastman Kodak in 2012, which was long headquartered in the city, and the impact that shutdown has had on the community. These are everyday scenes, but with such a sublime use of composition and light as to produce rich narratives and strong emotional qualities. The images fall squarely in the street photography genre. More specifically, the style is reminiscent of Lee Friedlander, especially as regards the use of reflections and creative juxtapositions of imagery. Rebecca’s "Kodak Park” was taken indoors, looking through a window onto an urban/industrial late fall scene: a ground-level billboard ad is prominent and in front of a small house, with a large, dark tree at center and smokestacks to the left, far in the background. Lettering on the window perfectly surrounds the head of the model in the ad, making her, though she is in the bottom right of the shot, the focal point of the image. Four other images by Rebecca feature a young girl or girls behind a window reflecting the outside scene, which partially obscures the subjects. The youths all look contemplative: a reflective mood emphasized by a reflection, further emphasized by the feeling one associates with staring out a window. The effect is visceral (it’s no surprise to learn that Rebecca was originally a poet). A similarity throughout the show, and one that gives it an overall thoughtful mood is that none of the people appear to be aware of the camera — never is someone looking toward the lens. The action captured conveys none of the self-consciousness of “acting naturally” in front of the camera. Shots devoid of people share a similar wistful or nostalgic tone: a prom dress hangs outside a home, a curtain breezily billows into a room. Alex’s "Diner, Henrietta" moves us from wistful to sad: looking out through the windows of a diner, a small lone figure is walking away, moving on. A standout for color, lighting, and composition is "Dance Hall, Lake Ontario.” Four seated seniors occupy the bottom third of the foreground; each one is partially spotlighted, which emphasizes the bright clothing worn by three. The middle ground is deep in shadow, and the background and upper third of the composition consists of a row windows and glass-paned doors through which we see the blue of the lake and the sky. It’s a powerful, poignant tribute to an era gone by.